Safe-T-sensor™ has been engineered to sense smoke from overcooked popcorn and other snack foods in the very early stages of combustion. At this stage, the microwave oven is turned off before it activates the smoke alarm. The overall objective is to dramatically reduce the number of “nuisance alarms” caused by microwave cooking, as well as to eliminate to the extent possible any penalties from smoke alarm activations. 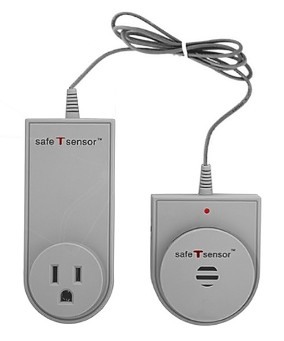 Safe-T-sensor™ is available for student purchase at any time during the school year. No college resident should be without these high tech Fire Shield ® products that provide maximum safety at a minimal cost! The only power strips that prevent cord fires, surges and overloads. Protects your student, family, home and equipment. The Fire Shield ® technology can detect electrical problems and prevent cord fires by shutting off power before a cord fire can occur. The University Logistics Security Safe features a keypad/card-swipe access system that allows easy operation with a personal code or credit card. The large 1.1 cu ft. storage capacity easily accommodates a laptop computer and accessories, CD player, Compact discs, camera, PDA, cell phone, video recorder, jewelry, travel documents, prescription medicines and other valuables.